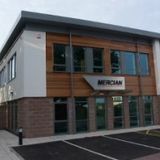 INTRODUCTION Mercian has been established as a supplier of high quality surgical instrumentation for over 40 years. We present our catalogue detailing our range of instrumentation for Plastic Surgery. These specialist Instruments are manufactured to the highest possible standards with the most modern processes. STANDARDS Mercian is certified to meet standard ISO 9001 - 2008. Recognised as a mark of excellence applicable to our management systems, processes and procedures. We are subject to continual assessment of these procedures to ensure standards are maintained by an independent outside notified body SGS UK LTD. Annual surveillance ensures our compliance with ISO 13485: 2003 and medical directive 93/42/EEC Annex V. WARRANTY To ensure our Instruments perform as expected, All Mercian Instruments are covered by a 12 Month warranty covering any manufacturing/material defect. Any Instrument failing these standards will be repaired or replaced without charges. CODE NUMBERS Mercian code numbers are designed to allow you to identify an instrument from only the number. The roller bar is smooth and does not oscillate or rotate in use. The graft thickness is controlled by slackening the locking nut and rotating the adjuster nut until the required thickness and then set by tightening the locking nut. The graft thickness is consistent as the roller bar can only be adjusted in parallel. The grooved roller bar oscillates from side to side as well as rotating. The graft thickness is controlled by rotating the adjuster nuts at the end of knife, this will move the roller bar up or down. The grooved roller bar only oscillates from side to side. The adjustment for the thickness of the graft is the same as the Braithwaite knife. The grooved roller bar rotates and oscillates from side to side. The graft thickness is controlled by adjusting the thumb screws on top of the support pillars. For endoscopic forehead face lift surgery with ergonomic handles. These instruments are used for maxillary advancement in Le Fort I, II, or III prodecures. A Large curvature of the blade prevents damage of the teeth. The oral blades are asymmetrical to adapt to the curvature of the palate which is often high and concave. The superior ramus separator in conjunction with the sagittal split separator allows controlled separation of the superior ramus osteotomy cut. It's unique blade action exerts force over a broad surface area for maximum control. This instrument is also useful in "down facturing" the maxilla by placement at the zygomatic butress osteotomy cut. Mercian Vessel Dilators have Mirror polished parallel tips for interluminal vessel dilation. The entire area is opened to the same diameter and the pressure is distributed evenly. This ensures that unnecessary damage to the vessel is avoided. These Scissors were designed by professor Phillip Blondeel for use in breast reconstruction utilising a perforator flap. A combination of ring handle design for preparation of fine structures, the round handle micro instrument handle allows the user to perform fine micro surgery. Mercian offer both a Basic Micro Surgery Instrument Set, equiping the surgeon with the basic Instruments for most micro surgery procedures and a reduced set suitable for Nerve and Tendon Repair. Throughout the series, the “V” pattern is the all-purpose clamp, commonly used on all veins, and almost all arteries. The “A” pattern, available in all sizes, is designed for exceptionally thick-walled vessels and slippery arteries. The slight incurve of the tips of the “A” pattern jaw provides extra security against slippage. The MT5000 Micro Torque Surgical Drill System is equipped with the most up to date and powerful micro motor which delivers high levels of reliability. 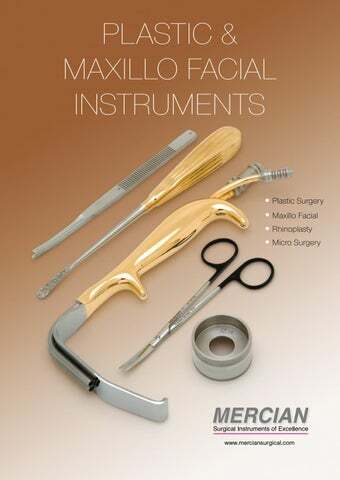 The range of Handpieces available allows a wide range of Surgery in Maxillo-Facial, E.N.T. and Craniofacial Surgery with both Bur and Micro Saw Handpieces available. The precisely controlled Irrigation System results in the cutting tool continually irrigated to the Surgeons requirements. Coburg Micro Surgery Stool Suitable for all types of micro surgery including: Neuro Surgery, Opthalmic Surgery & ENT Surgery.